Older people can make excellent foster parents; so if an older person has resisted getting a cat because they are worried that it may outlive them - then fostering could be the answer. Perhaps we may be able to arrange 'permanent fostering' of ‘Senior Kittizens to Senior Citizens, meaning they never have to give the pet up, and there are no worries about vets bills. People who take several holidays in the year often resist getting a cat as a result. However, short-term fostering can work well in such situations. 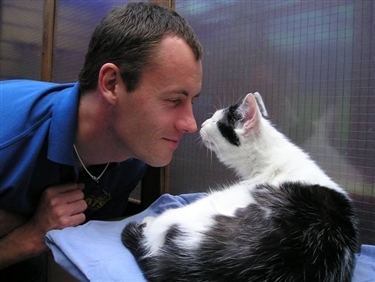 Co-ordinating with the rescue, becoming a short-term fosterer allows you the company of cats when you are home, and gives cats in need that vital halfway-house before they are permanently homed. If people who find it hard to cope with the grief when a pet dies, and so decide not to have pets at all, then fostering allows you to enjoy the company of cats again, but without the grief of bereavement... and instead experiencing the joy when they go off to a permanent, loving home, knowing that you helped them in their time of need. What Support Can You Expect From the Branch? Provisions: the branch provides all the essentials for your foster cat; litter, food, litter tray, beds etc. Veterinary Bills: Any veterinary bills will be met by the branch. You will have to use the branch’s nominated vet. Backup & Advice: At the end of a phone from the Welfare and Fostering Officers and also from the team of fosterers.